At the start of the month, U2 announced their eXPERIENCE + iNNOCENCE Tour 2018, and people had opinions almost immediately. Not simply because they announced a tour – the popular Irish rock band toured throughout pretty much all of 2015 and 2017 – but because for the first time ever, the band was selling tickets exclusively using Ticketmaster’s Verified Fan system. People have strong feelings about Verified Fan. 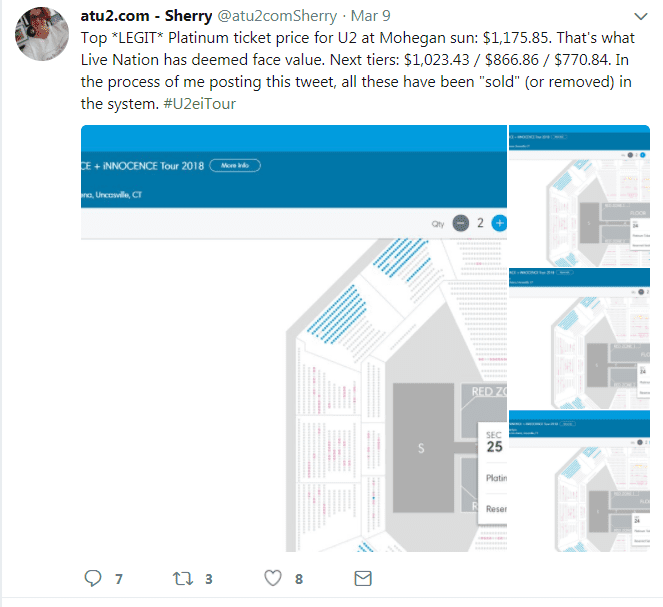 The program was created, according to Ticketmaster, to “separate actual, human fans from bots and scalpers” and to “thwart bad actors who are in the business of taking away tickets from fans just so they can resell them”. In an effort to do so, Ticketmaster requires interested concert-goers to register ahead of onsale time so that the program can run your information through some sort of magical algorithm that determines whether you like U2 enough to not resell your ticket (though emails uncovered during their ongoing lawsuit with Songkick show that a TM executive calls this “crowdsurge BS”). 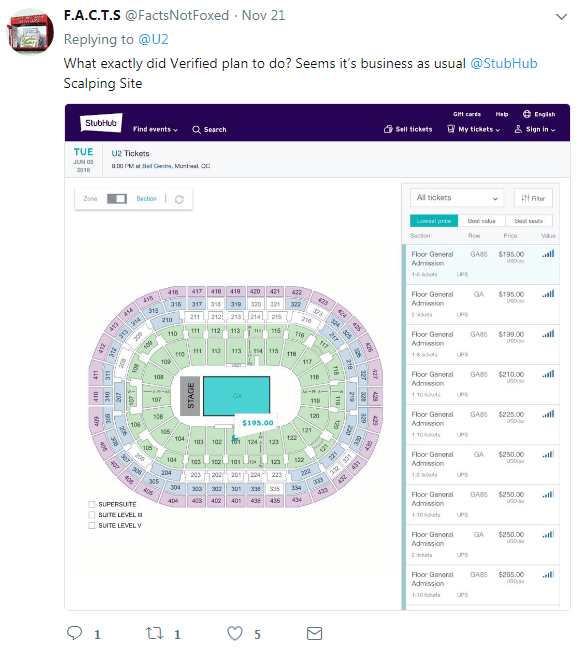 Verified Fan has historically been a presale program wherein those who are deemed human/fan enough to receive a code can then unlock the presale for a chance to buy tickets ahead of the general public. U2, however, made it so that every single ticket was locked behind either Verified Fan or one of the other various code-required presales. Given the decades-long career of the band and the age demographic of the majority of their fans, it seems unlikely that every U2 fan who planned to buy a ticket was on Twitter to see the various reminders to register. Tickets for the tour went on sale first to U2.com subscribers. Members of the fan club ($50 to join) were split up into two groups, called eXPERIENCE and iNNOCENCE, who had presales on two consecutive days. In order to be eligible for this presale, fans had to create a Ticketmaster account, connect it their U2.com account, enter their cell phone number, and agree to receive text messages where they’d (hopefully) be sent a code. Next up to bat: Citi cardholders. That’s right – randomly enough, U2 teamed up to give those with a Citi credit card the second round chance at tickets. This presale allowed the purchase of 4 tickets whereas paid fan club members could only purchase two. Of course, cardholders also had to register ahead of time, and fill out additional forms for each show they were interested in attending. Finally, tickets went on sale this morning to the rest of us – or, the rest of us who were made aware of the strictly-Verified-Fan program, remembered to register on time, and were part of the lucky bunch actually sent a code. Oh, and those whose code worked as apparently, many did not. Not that confusing, right? Totally fan friendly. Also, totally anti-resale effective. 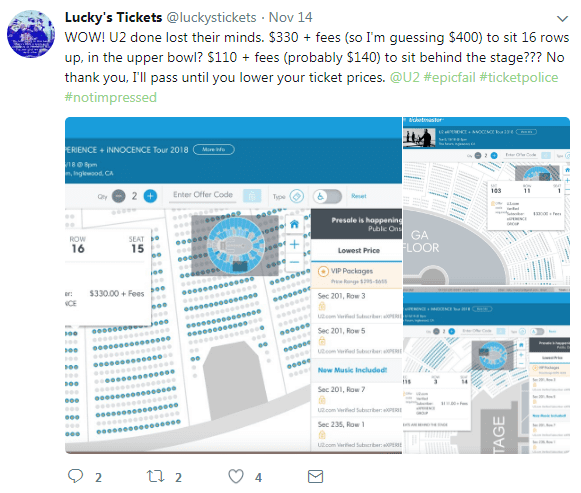 Speaking of prices, fans aren’t only complaining about needing to pay above face value after failing to buy tickets through world’s most complicated purchase process; many are complaining about paying the face value prices to begin with. U2 has already added a second date in Montreal, and it’s likely they may continue this pattern when other cities sell out. If that’s the case, at least those who were unaware of the Verified Fan-only process will now be able to sign up for the program the second time around. Or, they’ll succumb to the frustration and confusion and buy secondary – my guess is the latter.